While having lunch with colleagues Edward Teller and Herbert York, who were chatting about a recent cartoon in the New Yorker depicting aliens abducting trash cans in flying saucers, physicist Enrico Fermi suddenly blurted out, "Where is everybody?" [Webb2002, pg. 17-18]. His question is now known as Fermi's paradox. Behind Fermi's question was this line of reasoning: (a) There are likely numerous other technological civilizations in the Milky Way galaxy; (b) if a society is less advanced than us by even a few decades, they would not be technological, so any other technological civilization is, almost certainly, many thousands or millions of years more advanced; (d) Within a few million years after becoming technological (an eye-blink in cosmic time), a society could have explored and/or colonized most if not all of the Milky Way; (e) so why don't we see evidence of the existence of even a single extraterrestrial civilization? Clearly the question of whether other civilizations exist is one of the most important questions of modern science. And any discovery of a distant civilization, say by analysis of microwave data, would certainly rank as among the most significant and far-reaching of all scientific discoveries. For one thing, it would lend credence to the suggestion by some that the universe is primed for the emergence of life. As Freeman Dyson memorably declared in 1979, "As we look out into the universe and identify the many accidents of physics and astronomy that have worked together to our benefit, it almost seems as if the universe must in some sense have known we were coming." [Dyson1979, pg. 250]. The question of the existence of intelligent life also has religious implications. As Paul Davies observes, "The search for alien beings can thus be seen as part of a long-standing religious quest as well as a scientific project." [Davies1995, pg. 138]. As I planned the meeting, I realized a few day[s] ahead of time we needed an agenda. And so I wrote down all the things you needed to know to predict how hard it's going to be to detect extraterrestrial life. And looking at them it became pretty evident that if you multiplied all these together, you got a number, N, which is the number of detectable civilizations in our galaxy. The values used by Drake in 1960 were R = 10, fp = 0.5, ne = 2, fl = 1, fi = 0.01, fc = 0.01, L = 10,000, so that N = 10 x 0.5 x 2 x 1 x 0.01 x 0.01 x 10,000 = 10. In the wake of these analyses, scientists proposed the Search for Extraterrestrial Intelligence (SETI) project, which would search the skies for radio transmissions from distant civilizations in a region of the electromagnetic spectrum thought to be best suited (because of low background noise) for interstellar communication. Initially, the SETI project used existing radiotelescopes, but more recently it uses a large interconnected array devoted to the search for alien civilizations constructed in northern California, financed in part from funds donated by former Microsoft executive Paul Allen. The SETI project has by now searched the radio spectrum for several decades, at higher and higher frequency resolution, with ever-more-sophisticated equipment and computer processing facilities. But the bottom line of all this effort is that after 50 years of searching, nothing has been found. If there are indeed numerous technological civilizations in the Milky Way, as suggested by Drake's equation, why haven't we yet been able to detect any signals or other evidence of their existence? At the very least, if some distant civilization exists, they certainly have not made it very easy for us to find them. For a detailed discussion of these issues, see Fermi's paradox. Similarly, in 2015, astronomers at Penn State University announced that after studying a set of 100,000 large nearby galaxies, none of them had any obvious signs, such as an infared signature of huge amounts of expended energy, of a highly advanced technological society [Billings2015]. Two key terms in the Drake equation are fp (the fraction of stars that have planets) and ne (the average number of planets that can support life, per star that has planets). Scientists once thought that stable planetary systems in general, and earth-like planets in particular, were a rarity. But beginning in the 1990s, scientists detected unmistakable evidence of planets orbiting around other stars. More recently there has been a veritable explosion in the number of detected extrasolar planets. For example, NASA's Kepler spacecraft searches for planets circulating other stars by measuring small fluctuations in their light reaching earth. Until quite recently, though, there was scant evidence of earth-like planets in habitable zones that potentially could support life. A breakthrough came in September 2010, when Steven S. Vogt of the University of California, Santa Cruz, and R. Paul Butler, of the Carnegie Institution in Washington, discovered evidence of a planet only three or four times the mass of earth orbiting in the "habitable zone" of a star (i.e., at a distance from a star where water could exist) about 20 light-years away from earth [Overbye2010; Overbye2011d]. Since then, many more Earth-like planets in habitable zones have been identified. A November 2013 report found that roughly 20% of all sun-like stars (which constitute 20% of all stars) have Earth-like planets in the habitable zone, so that there are possibly as many as 40 billion such planets in the Milky Way [Overbye2013a]. A March 2015 analysis concluded that many billions of planets in the Milky Way have 1-3 planets in the habitable zone [SD2015a]. And the number of specific confirmed exoplanets in the habitable zone continues to grow. In January 2015, a team of astronomers announced a total of over 4,000 confirmed extrasolar planets, including eight new planets in the "Goldilocks" zone about their respective suns (where liquid water is possible) [Overbye2015a]. There are even efforts to confirm "exomoons" where life might exist [Aron2015]. In short, among the factors in the Drake equation, two that have proven amenable to experimental study so far have been found to have entirely reasonable values, roughly in keeping with what Drake and his colleagues first estimated in the 1960s. If anything, the terms fp (the fraction of stars that have planets) and ne (the average number of planets that can support life, per star that has planets) appear to be somewhat higher than estimated by Drake. As mentioned above, radio astronomers have been searching for extraterrestrial radio signals for 50 years, but so far have found nothing. Along this line, researchers at U.C. Berkeley selected a sample of 86 stars from a list of 1,235 known extrasolar planets and then used a large radio telescope to search for high-intensity, narrow-band radio signals, which presumably would only be produced by intelligent civilizations. They found none, and then concluded, based on a statistical model derived from their results, that fewer than one in one million stars in the Milky Way fit the category of being able to transmit such signals [Sanders2013]. On the other hand, given that there at least 400 billion (and possibly up to one trillion) stars in the Milky Way, this means that there still may be many thousands of such civilizations. There is also continuing interest in exploring the planets and moons of the solar system, to see if they harbor (or have harbored) any kind of life, even primitive life. Such findings may shed light on the value of the Drake equation term fl (the fraction of habitable planets that actually develop life). One very intriguing possibility along this line is that life may exist (or may have existed) on Mars. In 1976 NASA's Viking spacecraft performed experiments that produced tantalizing results, but which were subsequently interpreted as not indicative of life. Some researchers, however, were never satisfied with these findings. Interest in these results was revived in September 2010, when scientists analyzing results of NASA's Phoenix mission in 2008 found that a highly reactive perchlorate compound was present in the Martian soil. Since the Viking spacecraft had heated its samples to high temperature, it is likely that organic material, if present, would have been destroyed in the process. In other words, the original conclusion "no organics present" is drawn into question by the existence of this perchlorate compound in the Martian soil [Kaufman2010a]. But other scientists were not convinced. 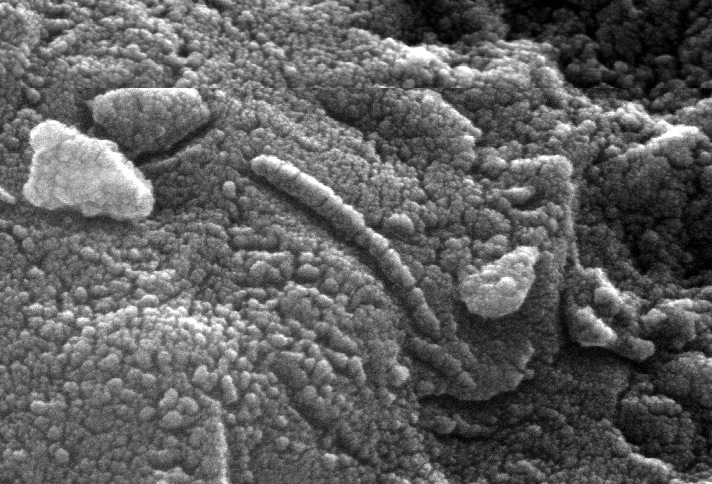 They argued, for instance, that these structures could have arisen from carbonate materials decomposing under high temperatures, such as during the impact of a large meteorite on Mars that may have ejected the ALH84001 sample. But just as with the Viking findings, some scientists were not so sure about this negative conclusion. Their view was bolstered in 2009, when a new study by McKay's team found that there was no plausible geological scenario that would be consistent with the claim that these structures arose from carbonate materials decomposing under high temperatures and pressures [Fisher2009]. Final resolution of this dispute will most likely need to await a Mars sample return mission, now scheduled for launch in 2018 (with return of samples in 2020-2022). Other planets and moons are also being investigated as possible havens for life. In 2010 a team led by Darrell Strobel of Johns Hopkins University found that acetylene is anomalously absent from the surface of Titan (Saturn's largest moon), and hydrogen is anomalously scarce there, lending strength to a 2005 conjecture by Chris McKay of NASA's Ames Research Center that microbial life might exist on Titan [Shiga2010]. The search for extraterrestrial intelligent life has always resonated rather strongly with modern religion. As Paul Davies (mentioned above) notes, "The search for alien beings can thus be seen as part of a long-standing religious quest as well as a scientific project." [Davies1995, pg. 138]. Along this line, it is quite ironic that the "zookeeper's hypothesis," which is the most commonly proposed solution to Fermi's paradox by prominent non-religious-believing scientists such as Carl Sagan, is precisely the hypothesis that is most akin to Judeo-Christian theology. After all, the "zookeeper hypothesis" strongly implies a universal system of laws (including a strictly enforced edict banning communications with Earth), which in turn implies a central galaxy-wide or universe-wide entity of enormous power and authority. If this isn't "God," it is an excellent facsimile of one. If someone eventually does discover unmistakable evidence of extraterrestrial intelligence, many believe this would shake up the world's religious faiths. It is true that few religious movements have seriously discussed the implications of other civilizations. Paul Davies discusses this topic at length, and then concludes "Christian theology is in a frightful muddle when it comes to extraterrestrial beings," and "a positive result from SETI would immediately open up a horrible can of worms. ... In any event, it is clear than any theology with an insistence on human uniqueness would be doomed." [Davies2010, pg. 192-193]. On the other hand, these concerns may be overblown. A 2010 study conducted by Ted Peters, Director of the Center for Theology and the Natural Sciences in Berkeley, California, found that while such a discovery would be very interesting, only 8% of Americans surveyed felt that such a discovery would result in a personal crisis of faith. An evangelical Christian commented in the survey "Why should we repudiate the idea that God may have created other civilizations to bring him glory in the same way?" An Islamic participant commented "only arrogance and pride would make one think that Allah made this vast universe only for us to observe." A Buddhist speculated that "ETs would be, essentially, no different from other sentient beings." Several LDS participants responded that their religion already accommodates extraterrestrials [Griggs2010; Peters2010]. With every new research finding of extrasolar planets, potential life-friendly environments within the solar system, and, especially, with every new advance of human technology, the mystery of Fermi's paradox deepens. Indeed, "Where is everybody?" has emerged as one of the most significant scientific and philosophical questions of our time. [M]y answer is that we are probably the only intelligent beings in the observable universe and I would not be very surprised if the solar system contains the only life in the observable universe. [Nonetheless,] I can think of no more thrilling a discovery than coming across clear evidence for extraterrestrial intelligence. If we are truly alone in the Milky Way or beyond, this greatly magnifies the paradox of fine tuning -- not only do we reside in an incredibly fortunate universe, but we occupy an incredibly unique time and place within that universe (see Fine tuned). Even if we are "only" extremely rare in the universe, this is a most important finding, with truly cosmic implications.